Wherever the problem, CECO can help. 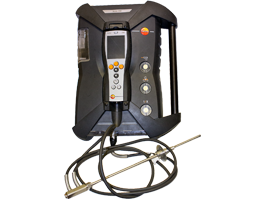 Although typically not as accurate as reference method analyzers, portable emissions analyzers with electrochemical cells can be a very useful and economical tool in emissions measurement. While typically thought to be suitable for quick spot checks, when calibrated properly, operated correctly, and verified through the appropriate procedures (linearity checks, drift checks, interference checks, etc) of the methodology being followed, portable analyzers can actually provide quality data. Methodology employed by CECO Emissions Testing team, and approved for compliance testing, include EPA Conditional Test Method CTM-030 and ASTM D6522-11. CECO can mobilize a technician with a portable analyzer and support equipment to your location anywhere in the United States, even offshore. Our experienced crews have extensive experience serving the natural gas transmission industry, performing both emissions and mechanical performance testing. Whether it is to troubleshoot a problem, profile emissions, optimize and verify combustion, or simply do your quarterly state tests, CECO can help. If engine analysis, compressor mechanical health determination, or horsepower measurements are also equired, that can be done at the same time. CECO prefers the TESTO 350XL portable analyzer, but our technicians have extensive experience with ECOMs and Horiba portable analyzers. Compounds analyzed are O2, CO, and NOx. CECO, Compressor Engineering Corporation © Compressor Engineering Corp. All rights reserved.